As parents, part of our job is to instill healthy habits in our children from the time they are young. Talk about healthy foods, prepare nutritious meals and snacks and incorporate regular exercise into your daily family routine to help kids develop habits that last a lifetime. From the time your little ones are toddlers, they can start learning about healthy foods. Don’t keep unhealthy, processed foods in your home and avoid the drive-thru as much as possible. Head to the farmers market: The farmers market is the perfect place for kids to learn about where food comes from. Here, you can teach them the differences between whole foods and processed foods. Let your children explore the market and find new fruits and vegetables that they have never tried before. Let kids help with meal planning: Children are more likely to try new foods if they are involved in choosing and making them. Bring kids into the kitchen, where they can help prepare your meals. Young children can wash fruit, tear lettuce and set the table. Older kids can actually do some of the cooking. 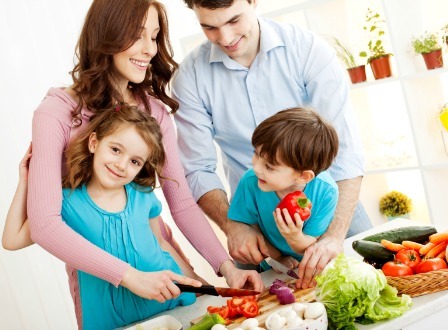 Together, your family can look through cookbooks (or recipes online) and plan meals together. Make a colorful plate: Color is fun — and it’s nutritious. When you are planning a meal, make sure to include plenty of colorful fruits and vegetables. Your family should eat a rainbow every day to get a variety of vitamins, minerals and other nutrients. When kids think of snacks, they imagine things like candy, cookies, chips and ice cream — but it doesn’t have to be that way. You can find snacks that your kids will love and that are nutritious too. 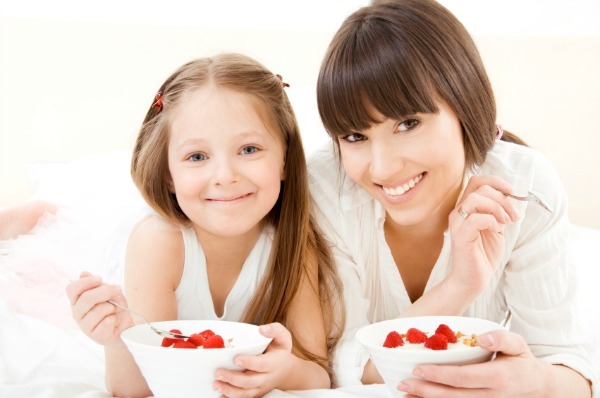 Start with yogurt: Yogurt can be a healthy afternoon snack for children. Be sure to read labels and avoid yogurt that contains added sugar. Plain Greek yogurt topped with fresh fruit and a little granola is a tasty (and nutritious) option for a snack or for breakfast. Find something crunchy: “Crunchy” doesn’t necessarily mean greasy potato chips. Nuts and seeds are crunchy and can provide a dose of relatively healthy fat. If kids insist on chips, look for baked chips at the store or consider baking your own sweet-potato chips at home. Make fruit available: Keep a bowl of fresh fruit out and available to your kids. You can also make a designated drawer or box of other nutritious snacks and let your kids know that they can choose one or two items from it whenever they feel hungry. Health isn’t all about diet. Children (and adults) need exercise, too. Stay active as a family. Incorporate exercise into your daily lives — it’s great for your health and for family bonding. Limit screen time: TV and video games can be great — in small doses. Instead of plopping down on the couch in front of the TV every night after dinner, go for a walk or a bike ride around the block together. Put some limits on your family screen time and stick to them. If your kids just must play video games, choose active games on the Wii or Xbox Kinect. Get outdoors: When spring comes around, the weather is perfect for getting outdoors with your family. Consider joining a family softball or basketball league. Take your kids to the park regularly for hiking or tossing around a Frisbee. Set a good example: You can’t expect your children to embrace exercise if they never see you get off the couch or move away from your computer screen in the evenings. Parents are their children’s best role models. Stop driving to places that you can walk to. Don’t use the elevator when you can use the stairs. If they always see you moving, your kids will follow your lead. Obesity rates in our country are astronomical. Help your children stay healthy now — and throughout their lives — by emphasizing healthy eating and daily exercise.